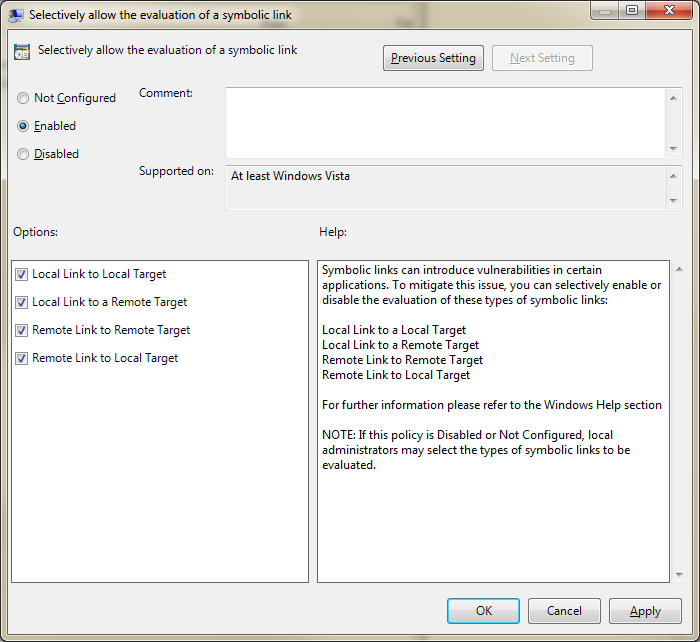 You have two methods to enable this - enable it locally on each machine, or enable it via Group Policy. Similarly, you can change the settings for Local to Local (L2L), Local to Remote (L2R), and Remote to Local (R2L) by using 1 for enabled and 0 for disabled. Once you've created your new GPO, test it and validate that it is successfully applied using gpresult /R and rsop. This post is from Group Policy Central, and is 4 years old, but I've verified that it works properly with Windows 7 and 8, and is just a beautifully done Group Policy. Thanks Kevin for creating it and thank Alan for sharing. Step 3. Select “Update” from the Action then type “Control Panel\Desktop” in the Key Path: text field then type “SCRNSAVE.EXE” in the Value Name text field and “C:\Windows\System32\scrnsave.scr” in the Value data: text field. Step 4. Click on the Common tab and then tick “Item-level targeting” and then click the “Targeting…” button. Now we will target the screen saver to apply only when the “HKCU\Control Panel\Desktop\SCRNSAVE.EXE” registry key does NOT exist as this means the screen saver has been configured to “(None)”. Step 5. Click on “New Item” then the “Registry Match” option. Step 7. Click back on the targeting setting in the top pane and press “F8” which changes the option to “does not exist” then click OK and OK. This policy will now apply the blank screen saver on the next group policy refresh to all targeted users whenever they select the “(None)”. This will allow the rollup to install properly. Other words, it will Roll Back and say that it Ended Prematurely. Another note on Rollup 6 for SP3 is that it takes (at least in my environment) an extremely long time to generate native images for .NET assemblies. One of my servers took 45 minutes for this process. Wait it out and you'll be able to get it installed, just plan your windows accordingly.